While today isn’t exactly a “holiday,” it is a great excuse to invite your friends over to your apartment and have an Election Day party. After all, we’ve endured two years of political campaigning, a barrage of political ads, and hours of partisan bickering. After all that we’ve been through, we deserve a great party with food, drinks, and lots of laughs. You don’t have to rush out and purchase decorations for this party. Chances are, you have some Fourth of July décor around, and that’s ideal for tonight. 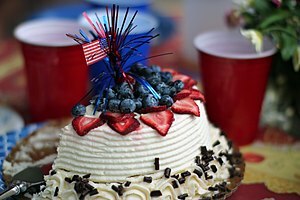 If you don’t have any Fourth of July party items, just think red, white, and blue. Find red candles, for example, and add a white tablecloth. Add blue dishware and you’re good to go. Party food is also simple. Strawberry and blueberry shortcakes with whipped cream, for example, are patriotic, fast, and easy. Pop up some popcorn and toss in some red and blue M&Ms and set that out for snacking. Use food coloring to tint batches of vanilla frosting and whip up some red and blue cupcakes. Make some sugar cookies and decorate with red and blue sprinkles. Don’t forget the drinks! Bright red raspberry martinis alongside blueberry martinis or strawberry margaritas next to blueberry margaritas will look as fun and festive as they taste. If you prefer to serve non-alcoholic beverages, try this colorful drink: in tall, clear glasses, add red punch (such as Hawaiian Punch) to each glass, then add blue Gatorade to each, and then add diet 7-Up. Due to the varying sugar content, the red will stay at the bottom, the blue in the middle, and the clear on top, creating a fun and patriotic drink. After years of campaigning, speeches, debates, commercials, rallies, accusations, heated exchanges, and dizzying spin, Election Day is finally here – so celebrate! And if you haven’t already done so, don’t forget to vote!